Let's tell the whole world that we are ALL connected by Invisible Strings! With 400,000 copies sold, this accessible, bestselling picture book phenomenon about the unbreakable connections between loved ones has healed a generation of readers--children and adults alike--and has been updated with new illustrations and an afterword from the author. Now available in paperback for the first time! Parents, educators, therapists, and social workers alike have declared The Invisible String the perfect tool for coping with all kinds of separation anxiety, loss, and grief. In this relatable and reassuring contemporary classic, a mother tells her two children that they're all connected by an invisible string. "That's impossible!" the children insist, but still they want to know more: "What kind of string?" The answer is the simple truth that binds us all: An Invisible String made of love. Even though you can't see it with your eyes, you can feel it deep in your heart, and know that you are always connected to the ones you love. Does everybody have an Invisible String? How far does it reach? Does it ever go away? This heartwarming picture book for all ages explores questions about the intangible yet unbreakable connections between us, and opens up deeper conversations about love. 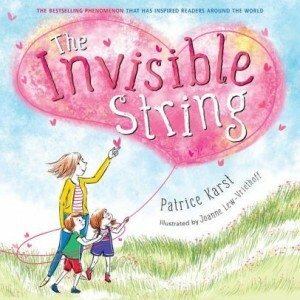 Recommended and adopted by parenting blogs, bereavement support groups, hospice centers, foster care and social service agencies, military, library services, church groups, and educators, The Invisible String offers a very simple approach to overcoming loneliness, separation, or loss with an imaginative twist that children easily understand and embrace, and delivers a particularly compelling message in today's uncertain times. This special paperback edition includes includes vibrant new illustrations and an introduction from the author.